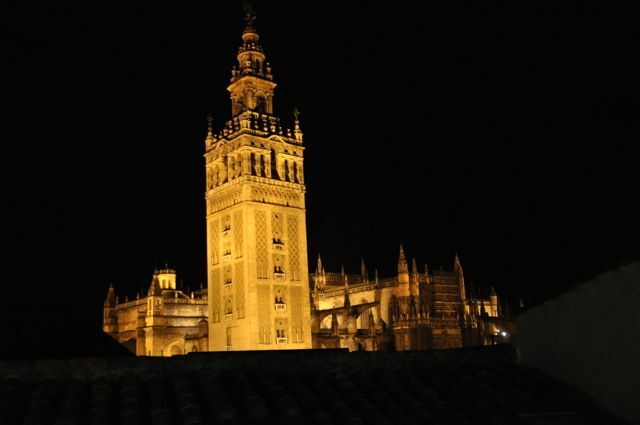 Well, let’s start off with the view of the Giralda tower from our hotel roof. It’s a pretty sight. Sevilla was Spain’s largest and richest city in the 1600’s, and today is still its 4th largest city. So it is big and bustling, with the advantage of the old center being a mayor tourist destination. The architecture of everyday houses is fascinating, along with the amazing Spanish ironwork which is truly everywhere. Sevilla’s architectural history is scattered about – The Torro del Oro (gold tower – it was originally covered in gold tiles) is Moorish from the 1200’s and was part of the city’s fortifications (pictures below). Note the locks on the door – these monstrous locks (with their equally humongous key holes) can be seen on many ancient doors throughout Spain). At the Plaza de Espana, the Spanish pavilion from the 1929 world’s fair, everything is a tile; quite impressive. And frequently one can find Rome’s impact, such as these incorporated portals (partially buried by two centuries of dirt, but just right for today). 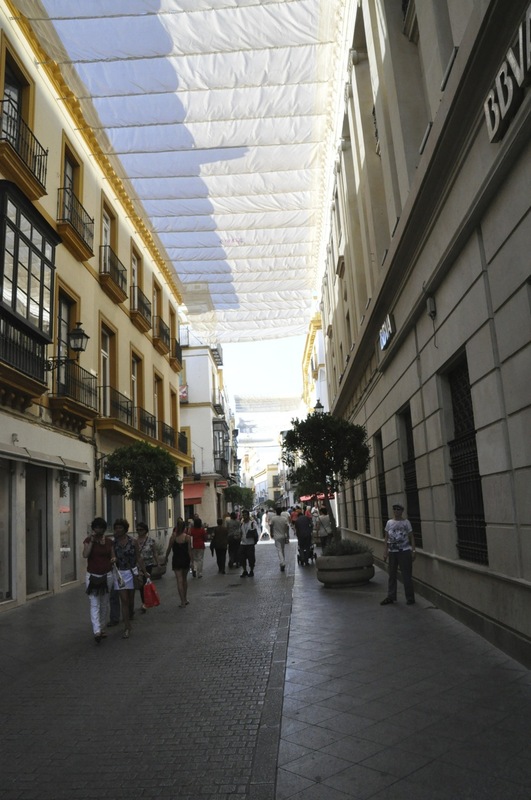 One of the interesting adaptations of Spain is their shopping; they don’t have malls as we know them, although small ones do exist (often as food markets). Shops are mostly small stores on the streets. Well, in the summer it is HOT! Temperatures were often over 100 degrees when we were there (you can’t get further south and still be in Europe). So the solution? The solution in the barrios from a century ago was to build really narrow streets; with buildings so close together, there is a lot of shade. And later? The solution is to put awnings over the street from the tops of the buildings, shading the streets. It works quite well. And perhaps I should mention food? Tapas are believed to have originated in Sevilla, and although we were not blown away by the fare other than the jamon (really good aged, cured ham), the ambiance is great. Most of the time eating is done outside in the cool of the evening (dinner starts at 9pm), and it is delightful. That last picture is from one of the Starbucks in Sevilla. Starbucks is everywhere, and I think you will see that it is better than in the US – many more choices! All for now! Next is the Alhambra. Oh my! This entry was posted in Sevilla, Spain.